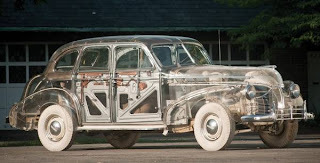 This beautiful, skeletal Pontiac was built for the GM pavilion at the 1939 New York World's Fair. It's up for auction in Plymouth, Michigan, with an estimated sale price of $275,000 - $475,000. Visitors to General Motors' "Highways and Horizons" pavilion at the 1939-40 New York World's Fair came away awed by a vision of the future. The work of renowned designer Norman Bel Geddes, GM's "Futurama" exhibit foretold the communities and transportation systems of 1960, many of which came to pass. Other peeks at the future included "Previews of Progress," inventions that seemed like magic: "Yarns made of Milk! Glass that bends! The Frig-O-Therm that cooks and freezes at the same time! The Talking Flashlight transmitting speech over a light beam!" exclaimed the exhibit's guidebook. Sharing top billing with the Futurama and Previews of Progress, however, was the "'Glass' Car - The first full-sized transparent car ever made in America."